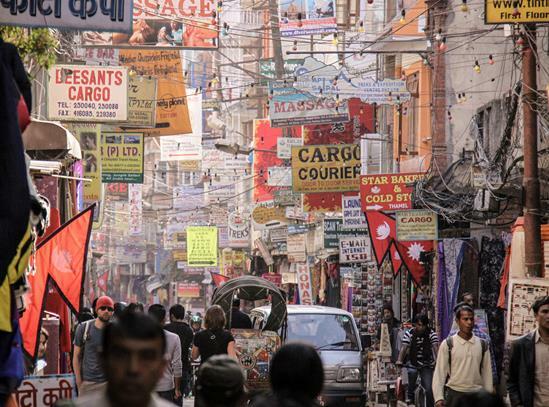 Kathmandu, the capital of Nepal, is chaotic, mesmerising, fascinating and exhausting all at the same time. This slightly bonkers city is an absolute assault on the senses but it’s also utterly captivating and I first fell under its spell when I arrived on the overnight bus from India - a journey that has haunted me for over 20 years! Now don’t get me wrong, compared to an Indian city, Kathmandu was still a mad old place with the same persistent stall holders and imploring beggars. But it was different. With the legions of trekkers visiting the area over the years, the city had come to cater very nicely for the needs of the independent western traveller - the pizzerias with wood fired pizza, cafés offering salads washed in filtered water and German bakeries with the best tasting cakes, were like nirvana to me after spending months in India living on Dahl! But then I got seduced by the vibrancy of the city and discovered the pure joy of wandering the maze of narrow streets uncovering hidden temples overflowing with bright coloured flowers, stumbling across little courtyards with medieval-looking workshops where artisans plied their trade by hand, mooching around bazaars selling produce of every colour, shape and smell imaginable and succumbing to religion as it's everywhere. Visiting many years later, the city had certainly grown beyond recognition and indeed sprawled to the edges of the valley, almost butting up against the Himalaya that circle it. But, although now very much a busy and hectic developing city, I was relieved to find that Kathmandu still had the charm I fell in love with many years ago, and with much of its architectural heritage subject to preservation programmes, the oldest areas are still a delight to behold. On a lofty hilltop just west of Kathmandu’s centre, Swayambhunath is best approached from eastern side by scaling 365 ancient steps that lead up the forested hillside. 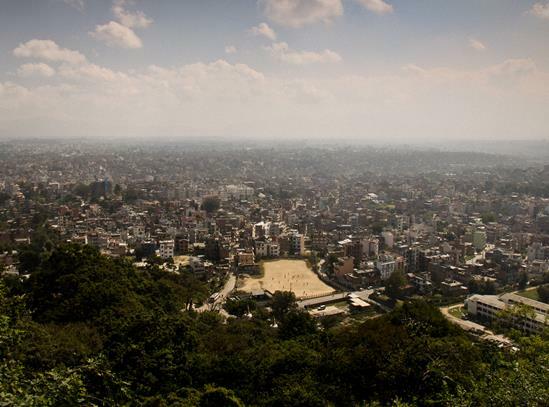 At the top you will be rewarded with far reaching views of the Kathmandu valley below. When you can avert your gaze from the view, you’ll find that this 1,500-year-old religious site actually consists of an immense stupa surrounded by a variety of temples and shrines jammed with local worshipers and the smell of incense and butter lamps hanging heavy in the air. 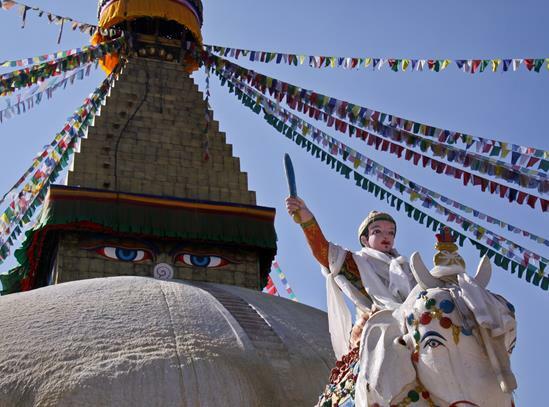 This huge white stupa, the largest in Nepal, is crowned with a gilded tower on which Buddha's all-seeing eyes are painted, whilst strings of prayer flags flutter above you. The area around the stupa has a strong Tibetan feel as many refuges settled here in the 1950s. To get your spiritual fill, visit at sunset when the red-robed Buddhist monks walk their daily kora (pilgrimage) in a clockwise flow around the base of the stupa which, amazingly with the din around, is carried out in a hushed reverence. 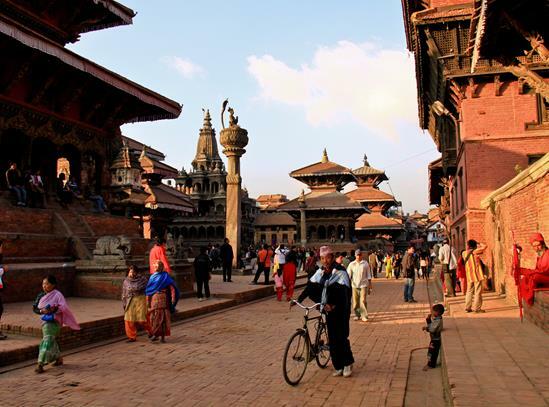 This ancient hub of Kathmandu is where kings were once crowned and from where they ruled (‘durbar’ means palace). This UNESCO World Heritage site is really a series of three linked squares set in front of the Grand Palace. 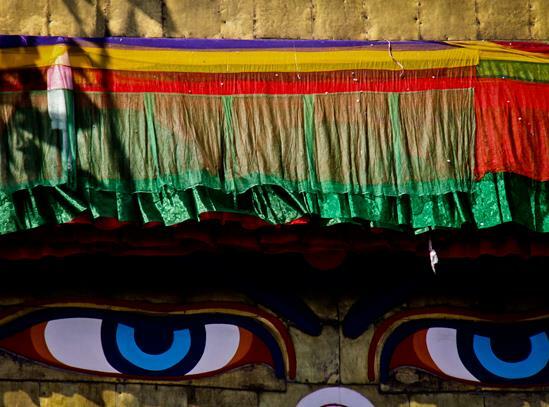 Here you’ll find over 50 elaborately carved temples which are some of the best remaining examples of Kathmandu's traditional architecture. The square is always packed with tourists, locals and cows so, take your time wandering round and watching the world go by from the terraced platforms of one the temples. One of the most fascinating attractions (albeit slightly bizarre) is Kumari Chowk which is the residence of Kumari Devi, the Living Goddess, a young Virginal girl chosen via an ancient and mystical selection process to become the human incarnation of the Hindu mother goddess, Durga. She then lives, almost prison like, in the house making an appearances on festivals when locals turn out to worship her. 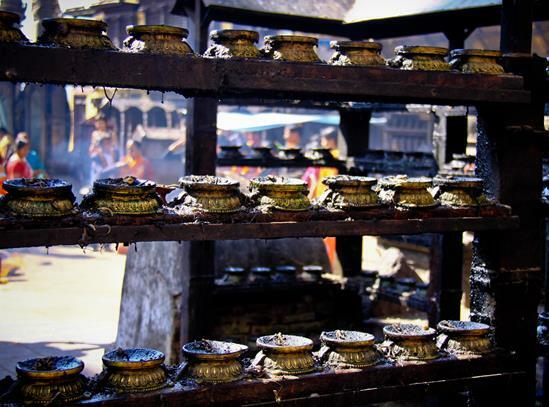 The Hindu temple of Pashupatinath is one of my all-time favourite places in Kathmandu. 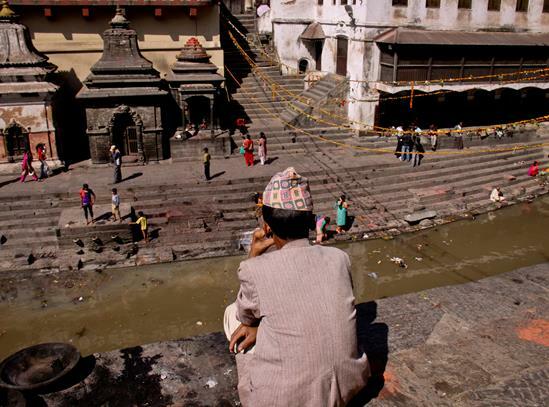 The sprawling complex is set on the banks of the holy (but filthy) Bagmati River and is one of Nepal's most sacred sights, attracting worshippers from afar, and it’s absolutely fascinating watching the comings and goings. There’s a main golden temple which is fringed by shrines, lingams and ghats used for cremations - don’t be alarmed if you wander past a few dead bodies! Non-Hindus can’t enter the inner sanctum, but the surrounding terraces command great views of this microcosm of Hindu life. Pashupatinath is where you’ll find lots of sadhus (holy men) with painted faces, long beards and outlandish garb who’ll kindly pose for a picture - but only if you cross their palms with silver! When you’ve had enough of Kathmandu’s dusty roads, noise and traffic jams take a trip to Bakhtapur. This beautifully restored Newari town - also a UNESCO World Heritage site - is a joy and filled with living heritage. Spend your time wandering the cobblestone streets that wind between red-brick buildings housing local shops, through a series of squares where locals gather to socialise or worship at one of the many temples, soaking up Bakhtapur’s vibrant cultural life and slow-paced, timeless ambiance. You could easily spend a week in the Kathmandu valley alone but, most people use if as the starting point for a trek in the dramatic Himalaya or Annapurna mountain ranges. Nature buffs head to beautiful Chitwan National Park to scan the treetops for exotic birds and comb the jungle on elephant-back tiger safaris. Or, you can use it (as we did) as a stopover en-route to Bhutan - read about our trip here. Whatever your reason for visiting Kathmandu, you will be welcomed by charming people into a colourful city that will surely entice you with its intoxicating mix of sights, sounds, smells and fascinating Nepali way of life. 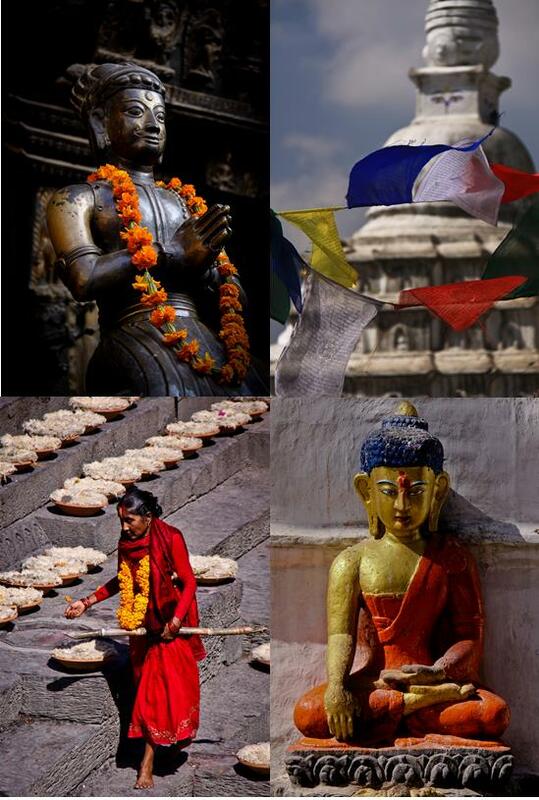 If you are interested in finding out more about Kathmandu and Nepal please do get in touch.